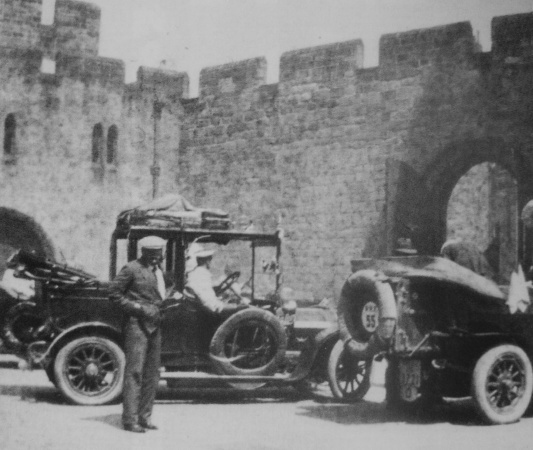 The Prince Henry Tour was an automobile race organized by Prince Henry (Prinz Albert Wilhelm Heinrich von Preußen, 1862-1929). This tour was a gesture of sporting good will in honour of King George V's coronation. Prince Henry participated to the tour himself. 37 German cars from the Kaiserlichter Automobil-Klub (mostly Opel, Benz and Mercedes, with 70-80 horse-power) versus 28 British cars from the Royal Automobile Club. 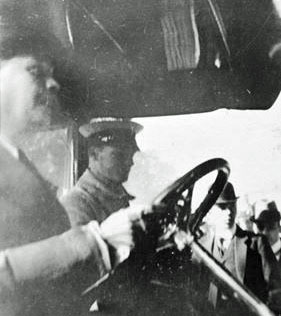 Sir Arthur Conan Doyle was one of the drivers for the British team (as No. 52 ). 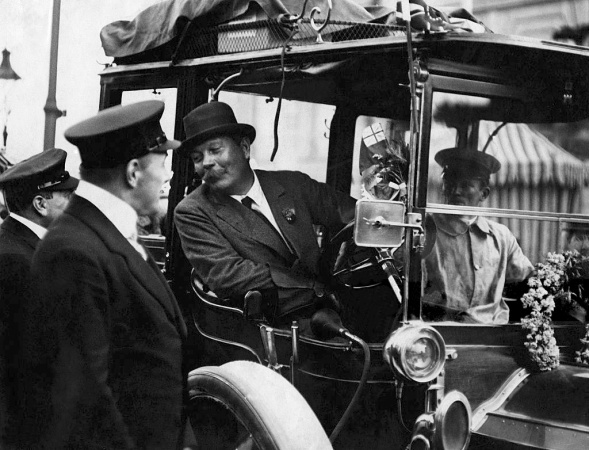 Each entrant had to drive his own car so Conan Doyle was driving his green 16 horse-power Dietrich-Lorraine which was called Billy as the surname of his daughter Lena Jean, and with a horse shoe stuck on the front as a mascot . 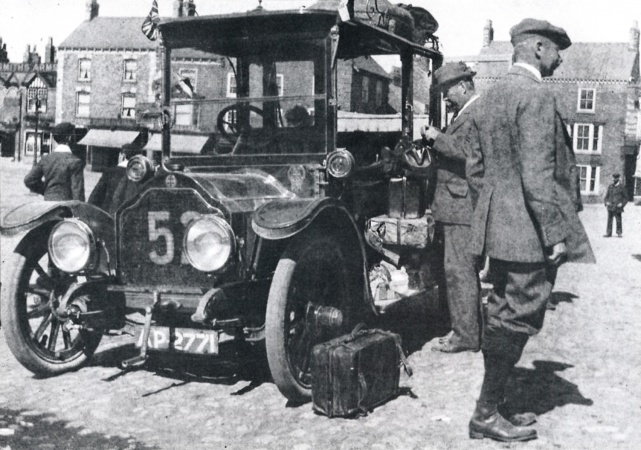 Each car had to carry an observer from the opposite country: an army or navy officer. Conan Doyle was hence accompanied by Count Carmer, Rittmeister of Breslau Cuirassiers. 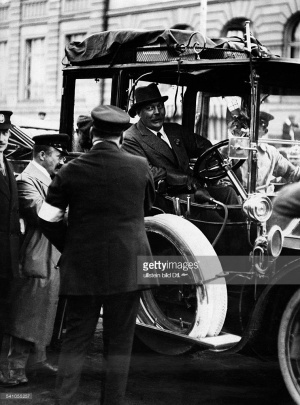 Jean Conan Doyle was also present and sitted in the open tonneau. It was said that, each morning during the race, Count Carmer used to put flowers in Jean's corner . 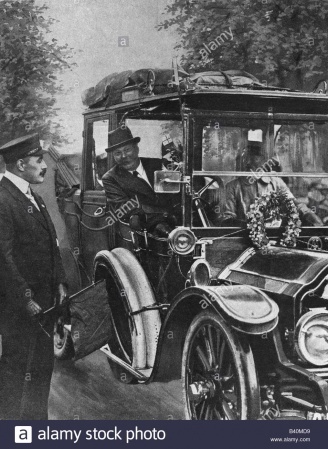 A chauffeur mentioned but not named by Conan Doyle, is mentioned as Alfred Stiller in the back of the car in Russel Miller biography . The race started from Homburg (Germany) on 4 july 1911 and ended in London (UK) on 19 july 1911. See route map. The British team won the race. The trophy was an ivory statue of a young lady with the word "peace" engraved below . The two teams joined in toasting the Kaiser at the Royal Automobile Club. « ... it is of interest now to remember some of the conversations to which I listened three years ago, when I was a competitor in the Anglo-German motor competition, called the Prince Henry Tour. It was a very singular experience, and was itself not without some political meaning, since it could hardly have been chance that a German gunboat should appear at Agadir at the very instant when the head of the German Navy was making himself agreeable (and he can be exceedingly agreeable) to a number of Britons, and a genial international atmosphere was being created by the nature of the contest, which sent the whole fleet of seventy or eighty cars on a tour of hospitality through both countries. I refuse to believe that it was chance, and it was a remarkable example of the detail to which the Germans can descend. 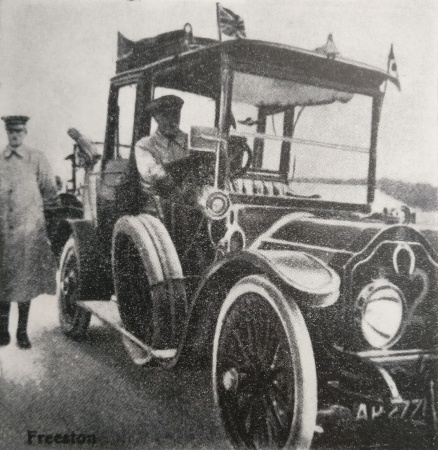 By the rules of the competition a German officer had to be present in each British car and a British officer in each German one during the whole three weeks, so as to check the marks of the driver. It was certainly an interesting situation, since every car had its foreign body within it, which had to be assimilated somehow with the alternative of constant discomfort. Personally we were fortunate in having a Rittmeister of Breslau Cuirassiers, with whom we were able to form quite a friendship. Good luck to you, Count Carmer, and bad luck to your regiment! To you also, little Captain Türck, Fregattencapitän am dienst, the best of luck, and ill betide your cruiser! We found pleasant friends among the Germans, though all were not equally fortunate, and I do not think that the net result helped much towards an international entente. In his auto-biography, Memories and Adventures (1923), Arthur Conan Doyle also related the event in two chapters. « One of my most remarkable pre-war experiences, which influenced my mind deeply, was my participation in the amateur motor race called the Prince Henry Competition. It was rather a reliability test than a race, for the car had to go some 150 miles a day on an average at its own pace, but marks were taken off for all involuntary stoppages, breakdowns, accidents, etc. Each owner had to drive his own car, and I had entered my little 16 horse-power landaulette. There were about forty British cars and fifty German, so that the procession was a very considerable one. 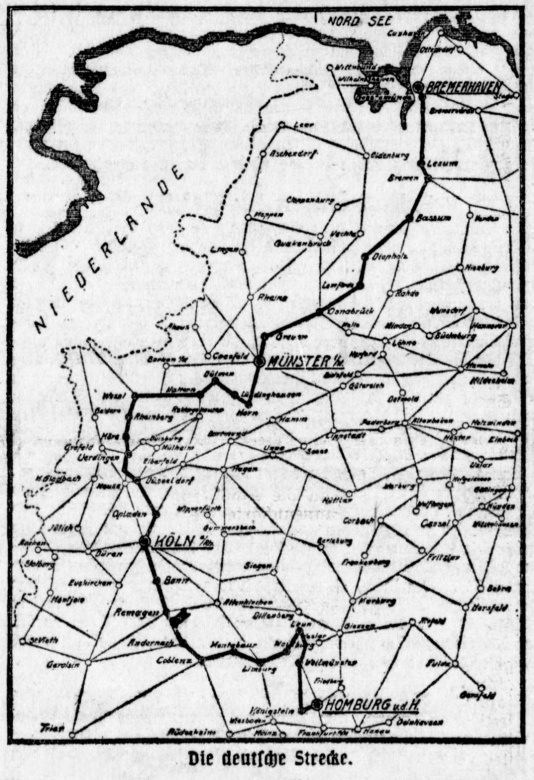 Starting from Homburg, the watering-place, our route ran through North Germany, then by steamer to Southampton, up to Edinburgh and back to London by devious ways. The competition had been planned in Germany, and there can be no doubt in looking back that a political purpose underlay it. The idea was to create a false entente by means of sport, which would react upon the very serious political development in the wind, namely, the occupation of Agadir on the south-west coast of Morocco, which occurred on our second day out. As Prince Henry, who organized and took part in the competition, was also head of the German Navy, it is of course obvious that he knew that the Panther was going to Agadir, and that there was a direct connection between the two events, in each of which he was a leading actor. It was a clumsy bit of stage management and could not possibly have been effective. The peculiarity of the tour was that each car had an officer of the army or navy of the other nation as a passenger, to check the marks. Thus my wife and I had the' enforced company for nearly three weeks of Count Carmer, Rittmeister of Breslau Cuirassiers, who began by being stiff and inhuman, but speedily thawed and became a very good fellow. The arrangements were very peculiar. 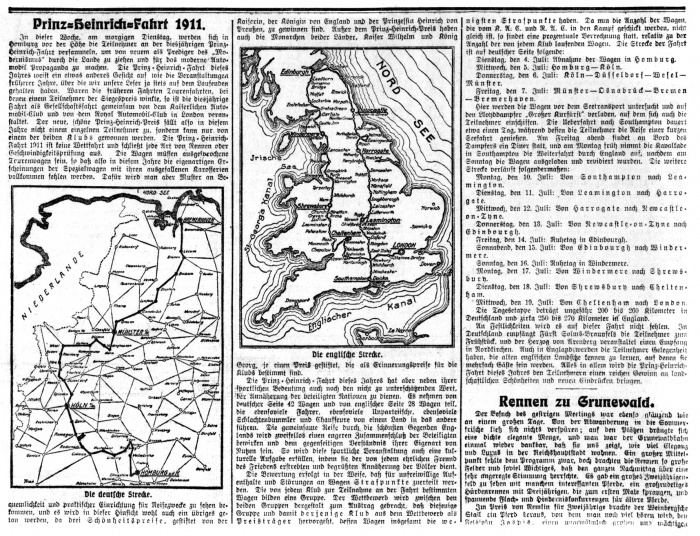 Some British paper—the "Mail" if I remember right—had stated that the Competition was really a device to pass a number of German officers through Great Britain in order to spy out the land. I think there may have been some truth in this, as our good Count when we reached London went off to a hotel down in the East End, which seemed a curious thing for a wealthy Junker to do. This criticism seems to have annoyed the Kaiser, and he said—or so it was reported—that none but junior officers should go as observers. I should think that ours was the senior of the lot, and the others were mostly captains and lieutenants. On the other hand, the British Government, out of compliment to Prince Henry, had appointed the very best men available as observers. If there had been a sudden crisis over Agadir, and Germany had impounded us all, it would have been a national disaster and would have made a difference in a European war. Speaking from an imperfect memory, I can recall that we had General Grierson, Charles Munro, Rawlinson, I think, Captain—now General—Swinton of Tanks fame, Delme Ratcliffe, Colonel—now General—Holman, Major—now General—Thwaites, and many other notables both of the Army and Navy. From the first relations were strained. There was natural annoyance when these senior officers found that their opposite numbers were youngsters of no experience. Then, again, at Cologne and Munster I understand that the German military did not show the proper courtesies, and certainly the hospitality which the whole party received until we reached England was negligible. The Germans themselves must have felt ashamed of the difference. Personally the competitors were not a bad set of fellows, though there were some bounders among them. We were not all above criticism ourselves. Of the Competition itself little need be said, as I have treated the sporting side of it elsewhere. Some of the Germans seemed to me to be a little mad, for they seemed consumed by the idea that it was a race, whereas it mattered nothing who was at the head of the procession or who at the tail, so long as you did the allotted distance in the allotted time. I saw a German bound into his car after some stoppage: "How many ahead? Three Englishmen! Forwards! Forwards!" he cried. They barged into each other, dashed furiously round corners, and altogether behaved in a wild fashion, while our sedate old fellows pursued their course in a humdrum fashion and saved their marks. There were, however, some good fellows among the Germans. I have not forgotten how one of them, anonymously, used to place flowers in my wife's corner every morning. But as an attempt at an entente it was a great failure. The British officer who was compelled to spend weeks with a car-load of Germans was not expansive and refused to be digested. Some of the Germans, too, became disagreeable. I saw a large German car—they were all Benz and Mercédès, generally 70-80 horse-power—edge a little British car right off the road on to the grass track beside it. The driver of the British car was a pretty useful middle-weight boxer, but he kept his temper or there might have been trouble. There was very little love lost on either side, though I, as one of the few German-speaking competitors, did my very best to bring about a more cordial atmosphere. But war was in the air. Both sides spoke of it. Several of the British officers were either of the Intelligence branch, or had special German experience, and they were unanimous about it. My attempts towards peace were rejected. "The only thing I want to do with these people is to fight them," said Colonel Holman. "Same here," said the officer with him. It was a deep antagonism on either side. They were not only sure of the war, but of the date. "It will be on the first pretext after the Kiel Canal is widened." The Kiel Canal was finished in June, 1914, and war came in August, so that they were not far wrong. There was some little German chaff on the subject. "Wouldn't you like one of these little islands?" 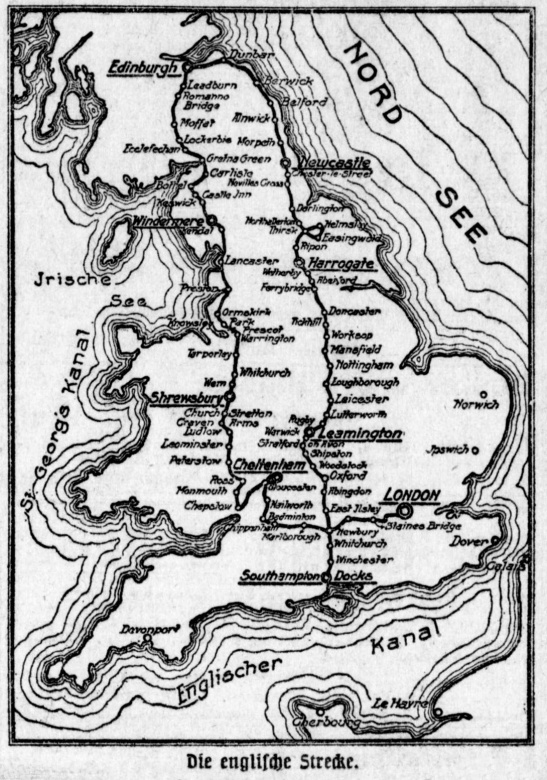 I heard a German say as we steamed out past Heligoland and the Frisian Belt. He also wrote a letter published in The Times on 11 july 1911 : The Prince Henry Tour. ↑ Not No. 23 as stated in Martin Booth biography (1997). ↑ The Life of Sir Arthur Conan Doyle, by John Dickson Carr (1949). This page was last edited on 21 February 2019, at 22:27.